Prototype: Five (5) different design German Federal Railroad (DB) express train passenger cars for the express train D 360 from Munich via Buchloe, Kempten, Immenstadt, to Lindau (with through cars to Chur and Lyon). Two (2) type Büm 234 compartment cars, 2nd class. 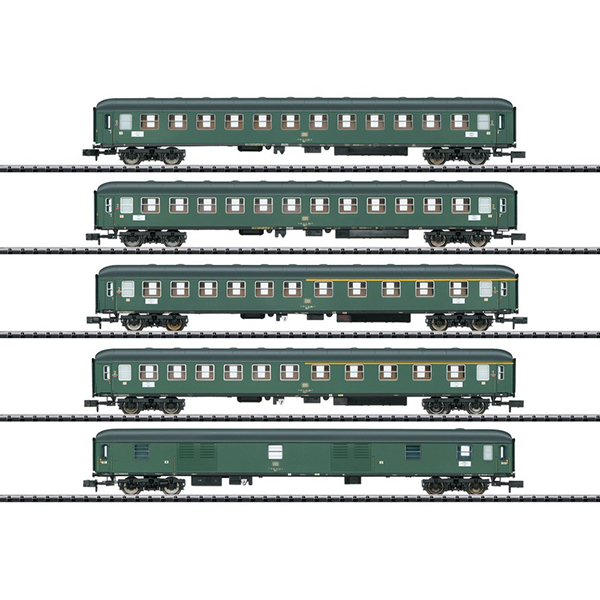 Two (2) type ABüm 225 compartment cars, 1st/2nd class. One (1) type Düms 905 baggage car. The cars look as they did around 1975. Model: All of the cars have close coupler mechanisms. Interior lighting can be installed in the cars. One (1) passenger car, 2nd class, has LED marker lights. The cars are individually packaged and marked. Total length over the buffers 825 mm / 32-1/2". First time for all cars to have fixed steps. First time for a 2nd class car with marker lights. Lighting kit to go in these cars: 66616 LED lighting kit.